Truth - Lion EP. Vinyl EP. Bleep. Truth roar back on Deep Medi with three tougher-than-thou soundsystem bangers. 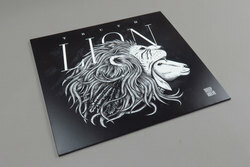 Title track ‘Lion’ sees Teklife affiliate Taso hop on board to recapture the magic than spawned the massive ‘Trenchtown’ back in 2014. Driven by a swung kick rhythm, the track lopes menacingly forward as a monstrous bassline provides the platform for an ethereal flute melody. ‘Messages’ is a detailed, mournful dub, with a ghostly jungle lick floating in and out of the half-time. Things close out with the gargantuan ‘Ruffneck’, a track with a riddim that sounds as if it was wrent from the seventh circle of hell. The snare drum alone is loud enough to blow speakers up and down the land.